As the official guardian of Ontario’s historical record, the Archives of Ontario is keenly aware that it must offer the public easy access to its vast and diverse holdings, and provide widespread opportunities to know more about our province’s rich and storied past. To this end, the Archives has long sought partnerships with museums, libraries, art and community centres – just about anyone, really, who values the Archives’ contributions to the life of the province – to collaborate on ways of disseminating this knowledge and maximizing the Archives’ outreach. 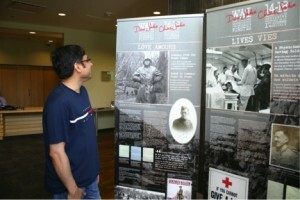 One of the most effective collaborative tools continues to be the travelling exhibit. The Archives makes available 12 robust travelling exhibits. They consist of three to five panels that measure two and a half feet wide by seven feet high and provide contextual information, including images and maps. 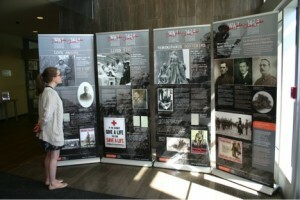 The topic of each exhibit may be thematic, such as sports in Ontario, or commemorative, such as World War I. They are offered completely free of charge, including shipping – you read that right – usually for periods of one to three months. Travelling exhibits reaffirm and energize the Archives’ mandate in communities large and small, from Cornwall to Kenora and from Windsor to Moosonee. Since they act as a means to increase awareness of what the Archives has to offer, our travelling exhibits showcase and speak to our collections and resources. The first and second panels. The first and most important panel retells the story of Private Harry Mason and his sweetheart, Sadie Arbuckle. As the centenary of World War I loomed, Archives staff brainstormed ways to mark this pivotal event, which helped catapult Canada to nationhood. Among the ideas that were given the nod was, not surprisingly, a travelling exhibit to be based on the Archives’ onsite exhibit. But what approach would the Archives take with an exhibit that would be viewed – in its distilled format – by a huge mix of people in every corner of the province? Since the federal government has all the official military records related to World War I, we needed to draw on the personal records housed in our collections. These include diaries, correspondence and photos that tell fascinating stories. One of our curators knew of some engaging correspondence that was perfect for the exhibit. These letters, exchanged between Private Harry Mason and Sadie Arbuckle, bring together the two great human experiences of love and conflict. What is particularly remarkable about this collection is that both Harry’s and Sadie’s letters survived. This two-sided narrative draws us more deeply into the reflections of people whose feelings for each other are coloured by the monstrous events of World War I. We are also very fortunate to benefit from the writings of two other players in the war. The first set of reminiscences is drawn from the diaries of John Mould. Private Mould recounts his horrific experiences in the trenches and describes his eventual return to France – just three years before the Second World War broke out – for the unveiling of the Canadian monument at Vimy Ridge. His writings reflect a fervent desire to keep alive the memory of the First World War in the interest of avoiding a similar conflagration. The second set is a collection of letters exchanged between field surgeon L. Bruce Robertson and a number of his patients. Dr. Robertson’s concern for soldiers did not stop after they had left his care, and he asked them to write him with news of their ongoing recovery. The poignant responses he received are remarkable for their expressions of gratitude, notwithstanding the often terrible mutilations they had sustained. All four panels of the exhibit. The fourth panel provides background on the exhibit and information on the resources available at the Archives of Ontario. A fourth panel serves as an addendum to the rest of the exhibit by providing background to the archival materials used in the exhibit. It also acts as a springboard to the myriad of resources available at the Archives for those wishing to delve further into Ontario’s contribution to the First World War. We were confident that our WWI travelling exhibit would be well received and, indeed, both copies have already been booked solid for 2014 and 2015. As a harbinger of success, the Toronto Star ran a front-page feature on the Harry/Sadie correspondence. Why the success of this exhibit? Perhaps because, paradoxically, a travelling historical exhibit will be popular to the extent that it speaks to current events or commemorations. These can trigger dynamic discussions, thereby allowing travelling exhibits to connect to relevant local, provincial or national issues. That is one way to make history active. With so many shared anniversaries on the immediate horizon – WWI, 400 years of Franco-Ontarian presence and Canada’s sesquicentennial – there has never been a better time to look more closely at travelling exhibits. The Archives is determined to put its collection of travelling exhibits to the best possible use so that Ontarians can learn more about the people and events that have helped shape who we are today. You are invited to visit the Archives of Ontario’s website to view them and explore the possibility of borrowing them. If you have not already visited our site, take this opportunity to explore the wealth of resources that the Archives makes available. Whether you are looking for vital statistics to complete a family tree, photos that capture the ordinary and extraordinary moments in the life of Ontario, government records or fine art, you will find it all here – and so much more – at the Archives of Ontario.